* The principal alternative is the scientific satellite constellation which may, for example, want to sample simultaneously the magnetosphëre and solar particle flux at various locations and altitudes. expensive than a six-satellite one, but this assumption may be wrong. The larger constellation may be at a lower altitude or inclination and, therefore, cost less to launch or have a less harsh radiation environment Alternatively, we may be able to have a smaller constellation with elliptical orbits, for which increased spacecraft complexity could offset the lower cost due to the number of satellites. A principal characteristic of any satellite constellation is the number of orbit planes in which the satellites reside. Symmetry in constellation structure requires an equal number of satellites in each orbit plane. This means that an eight-satellite constellation may have either one, two, four, or eight separate orbit planes. But because moving satellites between planes uses much more propellant than moving them within a plane, it is highly advantageous to place more satellites in a smaller number of planes. Moving satellites within an orbit plane requires only a slight change in the satellite altitude. This changes the period so we can slowly rephase the satellite within the constellation, and then return it to the proper altitude to maintain its position relative to the rest Thus, we can rephase many times using relatively little propellant If a satellite fails or a new satellite is added to a given orbit plane, we can rephase the remaining satellites so that they are uniformly spaced. The consequence of this is to provide a significant premium to constellations which contain more satellites in a smaller number of orbit planes. The number of orbit planes relates strongly to a coverage issue often overlooked in constellation design: the need to provide the constellation both performance plateaus and graceful degradation. Ideally one would like to achieve some performance level with the very first satellite launched and to raise that level of performance with each succeeding satellite. Generally, however, performance tends to come in plateaus as we put one more satellite into each orbit plane of the final constellation. If a constellation has seven orbit planes, we will achieve some performance with the first satellite, but the next major performance plateau may not come until one satellite is in each of the seven planes. We would expect this constellation to have plateaus at one, seven, fourteen, twenty-one, (and so on) satellites. Again, constellations with a small number of orbit planes have a distinct advantage over many-plane ones. A single-plane constellation produces performance plateaus with each added satellite, whereas one with two planes would have plateaus at one, two, four, six, eight, (and so on) satellites. Thus, more complex constellations will require more satellites for each performance plateau. Frequent performance plateaus have several advantages. First, because individual satellites are extremely expensive, we may want to build and launch one or two satellites to verify both the concept and the constellation's ultimate usefulness. If a constellation is highly useful with just one or two satellites, it offers a major advantage to the system developer. Another advantage is that coverage requirements are rarely absolute. More coverage is better than less, but we may not know at the time the constellation is designed how useful added coverage will be. For example, we may design the FireSat system for 30-min revisits, then later revise the response strategy so 45-min revisits can provide nearly equal performance. Communications constellations are normally thought of as having a very rigid requirement of continuous global coverage. Even here, however, they may want more coverage or greater redundancy over regions of high population density. A constellation of one or two planes can be more responsive to changing user needs than a system with multiple planes can. Because we often design constellations many years before many launch, we may not be able to correctly balance performance vs.
cost Both needs and budgets follow political constraints and economic priorities over much shorter periods than a constellation's lifetime. Thus if an eight-satellite constellation is highly useful with only six satellites, budget constraints may delay the launch of the remaining two. * At the same time, the constellation may expand to ten satellites if the first set generates substantial demand for more performance or greater capacity. This responsiveness to political and performance demands provides perhaps the largest advantage to constellations with a smaller number of orbit planes. Finally, a smaller number of orbit planes leads to more graceful degradation. In an eight-satellite, two-plane constellation, if one satellite is lost for any reason, we may rephase the constellation at little propellant cost and thereby maintain a high performance level corresponding to a six-satellite plateau. This rephasing and graceful degradation may be impossible for constellations with a large number of orbit planes. 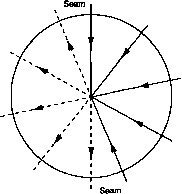 Another important characteristic is the orbit inclination. In principle, one could design satellite constellations with many different inclinations to get the best coverage. In practice this is extremely difficult because the rate of nodal regression for a satellite orbit is a function of both altitude and inclination. Consequently, satellites at a common altitude but different inclinations will regress at different rates, and a set of orbit planes which initially have a given geometric relationship with respect to each other will change that relationship with time. Otherwise, we would have to expend propellant to maintain the relative constellation spacing, a technique that is extremely expensive in terms of propellant and is achievable for only a short time or under, unique circumstances. Thus, we usually design constellations to have all the satellites at die same inclination. A possible exception is to have all satellites at a single inclination except for a set of satellites in a 0 inclination (equatorial) orbit Regression of die nodes is not meaningful for the equatorial orbit, so we can maintain constant relative phasing indefinitely between satellites in equatorial and inclined orbits. An example of such a constellation is satellites in three mutually perpendicular orbit planes—two polar and one equatorial. * One hopes that procuring agencies will not purposely select a rigid alternative to protect budgets. Fig. 7-10. The "Street of Coverage" Is a Swath Centered on the Ground Track for which there Is Continuous Coverage. Fig. 7-11. Coverage in Ad|acent Planes. If the planes are moving in the same direction, the overlap pattern can be designed to provide maximum spacing between adjacent pleines. This leads to a polar constellation often called Streets of Coverage, illustrated in Fig. 7-12, in which M planes of N satellites are used to provide continuous global coverage. At any given time, satellites over half the world are going northward and satellites over the other half aie going southward. Within both regions, the orbit planes are separated by DmaxS. Between the two halves there is a seam in which the satellites are going in opposite directions. Here the spacing between the planes must be reduced to Dmax0 in order to maintain continuous coverage. Fig. 7-12. "Streets of Coverage" Constellation Pattern. View seen from the north pole. Northward portions of each orbit are drawn as solid lines and southward portions are dashed. To achieve full coverage, orbit planes on either side of the seam must be closer together than the others. As the altitude changes, the fundamental constellation design changes and, consequently, the number of satellites and coverage characteristics change in steps. As a result, we cannot provide a meaningful chart of, for example, number of satellites vs. altitude without examining different constellation designs at different altitudes. While we may use this sort of chart to estimate constellation size, it would not provide realistic data for orbit design. Requirements other than coverage can also be important in constellation design, but most are directly related to coverage issues. For example, we may need several satellites to cover a point on the ground or in space at the same time. Navigation with GPS requires that four satellites be in view with a reasonably large angular separation. A similar requirement is cross-link connectivity among satellites in the constellation. Cross-link connectivity is geometrically the same issue as overlapping coverage. At any time when the coverage of two satellites overlaps (that is, they can both see at least one common point on the ground), then the two satellites can see each other and we can establish a cross-link. Thus, forming cross-links is equivalent to the problem of multiple coverage. Even apparently simple design problems can be very difficult, with solutions depending on various mission conditions. Perhaps the simplest constellation design problem is the question "What is the minimum number of satellites required to provide continuous coverage of the Earth?" In the late 1960s, Easton and Brescia  of the United States Naval Research Laboratory analyzed coverage by satellites in two mutually perpendicular orbit planes and concluded we would need at least six satellites to provide complete Earth coverage. In the 1970s, J.G. Walker [1971,1977,1984] at the British Royal Aircraft Establishment expanded the types of constellations considered to include additional circular orbits at a common altitude and inclination. He concluded that continuous coverage of the Earth would require five satellites. Because of his extensive work, Walker constellations are a common set of constellations to evaluate for overall coverage. More recently in the 1980s, John Draim [1985, 1987a, 1987b] found and patented a constellation of four satellites in elliptical orbits which would provide continuous Earth coverage. A minimum of four satellites are required at any one instant to provide full coverage of the Earth. Consequently, while the above progression looks promising, the 1990s are unlikely to yield a three-satellite full Earth coverage constellation or the 2000s a two-satellite constellation. While extensively studying regular, circular orbit patterns, Walker  developed a notation for labeling orbits that is commonly used in the orbit design community and frequently used as a starting point for constellation design. Specifically, die Walker delta pattern contains a total of t satellites with s satellites evenly distributed in each of p orbit planes. 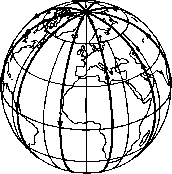 All of the oibit planes are assumed to be at the same inclination, i, relative to a reference plane—typically the Earth's equator. (For constellation design purposes, this need not be the case. But orbit perturbations depend on the inclination relative to the equator and, therefore, the equator is the most practical standard reference plane.) Unlike the streets of coverage, the ascending nodes of the p orbit planes in a Walker pattern are uniformly distributed around the equator at intervals of360 deg/p. Within each orbit plane the s satellites are uniformly distributed at intervals of 360 deg/s. The only remaining issue is to specify the relative phase between the satellites in adjacent orbit planes. To do this we define the phase difference, A0, in a constellation as the angle in the direction of motion from the ascending node to the nearest satellite at a time when a satellite in the next most westerly plane is at its ascending node. 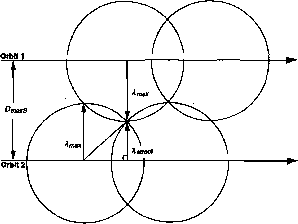 In order for all of the orbit planes to have the same relationship to each other, A0 must be an integral multiple,/, of360 degIt, where/can be any integer from 0 top -1. So long as this condition holds, each orbit will bear the same relationship to the next orbit in the pattern. The pattern is fully specified by giving the inclination and the three parameters, t, p, and / Usually such a constellation will be written in the shorthand notation of i: t/p/f. For example, Fig. 7-13 illustrates a Walker constellation of 15/5/1 at i = 65 deg. Table 7-11 gives the general rules for Walker delta pattern parameters. While Walker constellations are important to constellation design, they are not the only appropriate options and do not necessarily provide the best characteristics for a given mission. Walker intended to provide continuous multiple coverage of all the Earth's surface with the smallest number of satellites. This plan may or may not meet all the goals of a particular program. For example, equally distributed coverage over the Earth's surface may not be the most beneficial. 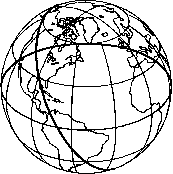 We may wish to provide global coverage with the best coverage at the poles, mid-latitude regions, or the equator. In these cases, we may want constellation types other than Walker orbits. Fig. 7-13. A15/5/1 Walker Constellation at 65 deg Inclination. Circles are centered on each of the 15 satellites. The double circle is on a satellite at its ascending node. TABLE 7-11. Characteristics of a Walker Delta Pattern Constellation. See Walker . T/P/F — Walker Delta Patterns t = Number of satellites. p= Number of orbit planes evenly spaced In node. f= Relative spacing between satellites In adjacent planes. Define ssfp= Number of satellites per plane (evenly spaced). Planes are spaced at Intervals of s PUs in node. Satellites are spaced at intervals of p PUs within each plane. If a satellite Is at its ascending node, the next most easterly satellite will be fPUa past the node. /Is an integer which can take on any value from 0 to (p-1). Example: 15/5/1 constellation shown in Rg. 7-13. 15 satellites In 5 planes (f= 15, p= 5). 3 satellites per plane (sst/p= 3). Pl/=360/f= 360/15 = 24deg. In-plane spacing between satellites = PUxp=24x5=120deg. Node spacing =PUx s = 24 x 3 = 72deg. Phase difference between adjacent planes= PUxf= 24 x 1 = 24deg. the regions of interest were within 50 deg of the equator, we would want to consider a constellation having several equatorial satellites with enough altitude to provide the appropriate coverage at the smallest spacecraft elevation angle. 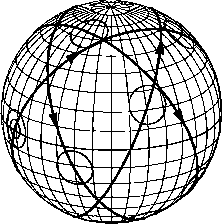 If all or most regions of interest are above a given latitude, a direcdy polar constellation would allow all satellites to see the region of the pole on every orbit Thus, if all targets of interest were within 50 deg of the pole, a polar constellation with a single orbit plane could provide excellent coverage. If most targets were in the polar region with lesser interest in the equatorial regions, a two-plane polar constellation could provide continuous or nearly continuous coverage of the pole while providing reduced but good coverage of the equatorial regions. One might also consider a mix of polar or high inclination satellites with some satellites at the equator to provide the added coverage needed there. Another class of non-Walker constellations consists of two planes at right angles to each other. If both planes are perpendicular to the equator it will be a polar constellation. Although it will have substantial symmetry, it is not one of the Walker delta patterns. The two planes can also be tipped relative to the equator to achieve any inclination from 90 to 45 deg. Again the ascending nodes are such that they are not Walker constellations except when the inclination is 45 deg, in which case they reduce to a Walker two-plane configuration. Figure 7-14 shows examples of several non-Walker constellations. Fig. 7-14. Examples of Typical Non-Walker Constellations. 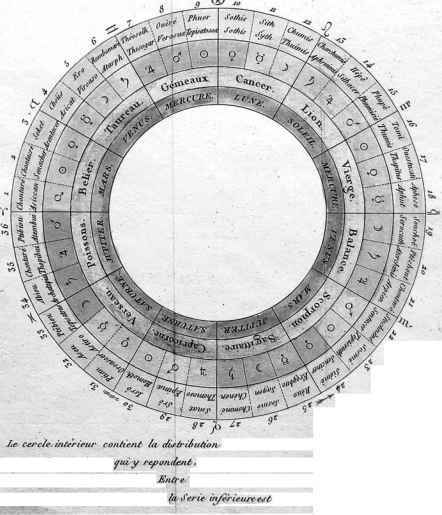 All orbits are assumed to be circular. A final example of non-Walker constellations is the Molniya orbits used for Russian communication satellites. Sections 6.2 and 7.4 describe them in more detail. As mentioned above, these constellations can fully cover high northern latitudes while requiring much less energy than circular high-altitude orbits. Constellation design is complex, requiring us to assess many issues and orbit characteristics. We must certainly pick a preliminary design, but this complexity demands that we document the reasons for that design and remain aware of alternatives as orbit design continues. Unfortunately, systematic reassessments of constellation design are difficult under typical budget constraints and the constellation pattern is often locked in very early in mission design. Unfortunately, we cannot use analytic formulas to design a constellation. With numerical simulation, we can evaluate some of the Figures of Merit defined in Sec. 7.2. (That section discusses how to lay out the simulation for unbiased results.) Generally the results of such a simulation are best expressed as Figures of Merit vs. latitude for the various performance plateaus. Thus, a typical decision plot might include mean response, percent coverage, and maximum gap as a function of latitude for the various constellations being considered. Often, we must also evaluate coverage data for different instruments on board a spacecraft Each instrument has its own coverage area and, therefore, a different swath width will apply for each principal observation type. Thus, the coverage associated with one instrument may differ dramatically from that associated with another instrument or operating mode. Alternative operating modes or instruments will likely lead us to prefer distinctly different constellation designs. We may then choose either different satellites or a compromise between the alternative instruments or modes. The coverage associated with different instruments or operating modes is best expressed as coverage vs. latitude (see Sees. 7.2.2 and 723). I regard the mean response time as the best overall measure of coverage, although percent coverage and maximum gap can also be important in some applications. We must use the maximum gap measure carefully because this single point should not be allowed to drive the design of an entire constellation as it will typically not provide the best overall performance for the cost. As described in Sec. 7.6.1, this is a key issue in practical constellation design. It will be different for each constellation type. In evaluating growth and degradation we should assume that rephasing within the orbit plane can be done at very modest propellant cost, and that changing orbit planes is not feasible. TABLE 7-12. Constellation Design Summary. See text for discussion. See also Tables 7-11, 7-14, and 7-15 for additional details. 3. Do trades between swath width (or maximum Earth central angle), coverage, and number of satellites. 4. Evaluate ground track plots for potential coverage holes or methods to reduce number of satellites. 5. Adjust inclination and in-plane phashg to maximize the intersatellte distances at plane crossings for collision avoidance. 6. Review the rules of constellation design in Table 7-13. 7. Document reasons for choices and Iterate.